Two South Carolina teams climbs into rankings as preseason No. 1 Norco keeps rolling. 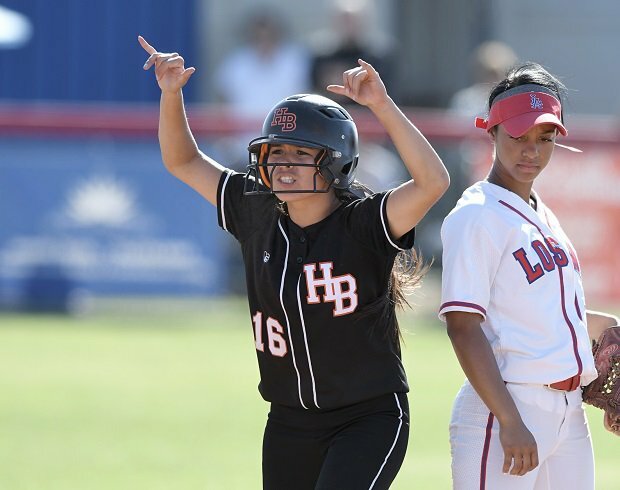 High-ranking teams keep falling from MaxPreps Top 25 softball rankings and expect the same next week as a pair of Southern California rivals square off this week. For the third-straight week a top-three team lost and five teams overall dropped out of the Top 25. And with a showdown between unbeaten and second-ranked Huntington Beach (Calif.) vs. No. 7 Los Alamitos (Calif.) (9-2) on Tuesday, another shuffle is on the horizon. Staying unscathed, however, is No. 1 Norco (Calif.), which ran its record to 15-0. The Cougars have protected their preseason top ranking with strong pitching and defense. They've committed eight errors in 386 chances. Last week's No. 2 Marist (Chicago) opened the season in Arizona losing two of six and dropping to No.25. Lakewood Ranch (Bradenton, Fla.), moved up to No. 3, followed by Foothill (Pleasanton, Calif.) and Cedar Ridge (Round Rock, Texas). The biggest mover of the week was Santa Margarita (Rancho Santa Margarita, Calif.), which jumped from No. 25 to No. 14. The Eagles also find themselves in a Southern California showdown with a game against No. 18 Orange Lutheran (Orange, Calif.). White Knoll Lexington (S.C.) vaulted from unranked to No. 15 and is one of two Palmetto state teams ranked. Byrnes (Duncan, S.C.), 9-0, is the other. Also new to the Top 25 this week are Deer Park (Texas), Spain Park (Hoover, Ala.) and Jackson (Mill Creek, Wash.). Stevie Hansen (5-0, 0.25 ERA) and Sarah Willis (10-0, 0.55 ERA) have allowed six earned runs in 15 wins. MaxPreps All-American catcher Kinzie Hansen is hitting .512 with 19 RBI. The Oilers recorded a pair of one-run wins Saturday, scoring in the bottom of the seventh to beat King (Riverside) 5-4 and twice in the bottom of the seventh to beat JSerra (San Juan Capistrano). Prior to the one-run victories, the Oilers had outscored six opponents, 62-3. Up next: No. 7 Los Alamitos. After opening the season with six-straight shutouts, the Mustangs gave up three runs in 6-2 and 9-1 victories. After allowing three runs in two games, junior Nicole May (Oklahoma pledge) recorded her third shutout on the young season. The Raiders are making it seem easy after outscoring two opponents, 23-1. Megan Hagge, Taylor Thomas and Aynslie Furbush have combined for a 0.72 ERA. The Griffins have recorded a pair of run-rule wins heading into Tuesday's showdown with unbeaten and No. 3 Huntington Beach. Junior hurlers Lauren Hobbs and Alex Salter have struck out 122 in 69 innings and allowed four earned runs. Hobbs also has three homers and 15 RBI. The Jackrabbits have won four straight via shutout. The Rockets have 47 straight wins dating back to last season. Since its one-run loss, Oakleaf has won twice by shutout. The Eagles have won 18 in a row and own 14 shutout wins this season. The Blue Darters are pitching-strong led by Nyah Vogel's 5-0 record and 0.72 ERA. The Eagles meet No. 18 Orange Lutheran (Orange) on Tuesday. Senior Andrea Lyon has three shutouts and a 0.75 ERA in the T-Wolves' 7-0 start. The Sharks lost 1-0 to No. 1 Norco, but own a 2-1 win over No. 7 Los Alamitos. Since losing 1-0 in extras, the Deer have won nine straight. The Lancers play 13-0 No. 14 Santa Margarita (Rancho Santa Margarita) on Tuesday. The Titans are averaging a home run per game. Since being no-hit by Neshoba's Aspen Wesley, the Pirates have won six straight. The Lady Rebels remained unbeaten and won the Byrnes Softball Invitational, defeating Upstate 3A power Union, 10-0, in the championship game. The Ravens are led offensively by junior Takiya Hill (.559 batting average, 18 RBI) and in pitching by sophomore Vanessa Brink (8-0 with a 1.26 ERA). The Jaguars have 11 straight wins, including a, 18-2 rout of rival Hewitt-Trussville. Annabelle Widra led the Jaguars with four hits. The offense hit five home runs — Caroline Wooley (2), Maddie Majors, Widra and Lydia Coleman. The T-Wolves have opened 3-0 as senior pitcher Ice Pennington has 42 strikeouts in 19 innings. Teammate Macy Tarbox has eight hits, eight RBI and scored five times. The Redhawks opened the season by being no-hit by Hamilton (Chandler, Ariz.) sophomore Loganne Steppe, but bounced back to go 4-2 in their season-opening tournament in Arizona. They scored 41 times and allowed 14. The losses were 3-0 to Hamilton and 1-0 to Centennial (Peoria, AZ). Dropped out: Chino Hills (Calif.), East Central (San Antonio), Pinnacle (Phoenix), Bonney Lake (Wash.) and Gahr (Cerritos, Calif.).